The progressive load deflection characteristics of the new Work-Rite kit will smooth your ride when your vehicle is fully loaded, and wont compromise your ride when its not. 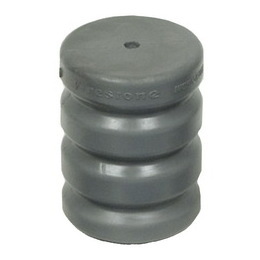 These load assist springs are injection-molded, and are made of microcellular urethane. They do not use air like the Ride-Rite family of springs so there is no air pressure to monitor. Work-Rite load assist springs are made of a base polymer developed specifically for the automotive environment with low temperature flexibility and a high repeated compression resistance. They are adjustable for individual loading scenarios using spacers provided in each kit. There are six separate spring-geometry and stiffness combinations for several applications for light duty trucks, vans, and SUVs. Most work-Rite kits are a no-drill design, which means they use the existing holes in the frame for installation and require only simple hand tools. The Work-Rite load assist springs are maintenance-free with a limited lifetime spring warranty and provide a more comfortable, safer ride for you and your cargo.